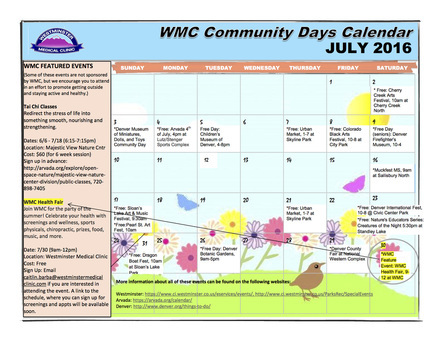 What are WMC Community Days? Join Westminster Medical Clinic for field days, potlucks, nature walks, classes, free days at museums, organized benefit walks, festivals, and more. This Valentine’s Day Season, share the LOVE with the WMC Community! WMC will be collecting winter clothing and non-perishable food items NOW through February 12th for WMC patients and families in need this winter! Stop by the lobby to drop off your donations in the designated bins. We are collecting the following items: winter jackets/coats, snow pants, long sleeve shirts/sweatshirts/sweaters, pants/sweatpants, pajamas, blankets/sleeping bags, scarves, hats, gloves/mittens, socks, winter boots/shoes, canned chicken/tuna/salmon, canned beans/veggies (low sodium preferred), dried fruits/nuts, granola Bars, applesauce, whole grain pasta, sauce, soups/chili, peanut butter, whole grain cereal, whole grain crackers. To support the health and wellbeing of our community, please do not donate unhealthy food items, items packaged in glass or cellophane, and items that require can openers. Do you need or know a WMC patient or family that is in need of winter clothing and food? All remaining items leftover from the drive will be donated to Fish of Westminster as well as other local Westminster organizations that serve the community. Questions? Please contact, Jamie at Jamie@Westminstermedicalclinic.com, 303-428-7449. Upcoming WMC Weekend Wellness Events! Photos of Past Events & Outings! WMC Day at the Beach: Celebrating WMC's 65th Anniversary! We had a great day celebrating WMC's 65th anniversary at A-Basin just before the snow melted! Thanks to all of the staff and patients who joined us for some skiing and celebrating under the sun! We look forward to future beach days next winter. Until then, we plan to continue to celebrate our 65th year through more events and activities! Stay tuned! We successfully celebrated fall with a Family Yoga class followed by a visit to Rock Creek Farm's Pumpkin Patch. From making up new pumpkin yoga poses to practicing the falling leaf breath to searching for the craziest pumpkin at the patch and even racing tumbleweeds..it was evident that fall was here and it was awesome! Tai Chi is great for your health and we experienced just that during out introductory class with Jim West on Saturday, September 9! Jim West taught us the Sun Form, which consists of slow, peaceful movements that help develop grace, balance and concentration, while reducing stress and calming our minds. It was a great way to kick off the weekend. If you are interested in an on-going Beginner's Tai Chi Class with Jim, contact Stacey at stacey@westminstermedicalclinic.com. Be sure to check out our photo album for more photos from the class. We had a great day on the trails exploring Mt. Falcon and connecting to nature! Although we didn't see any bears, the chipmunks, squirrels, deer, birds, and bugs kept us company and greeted us along the way. From listening to the bugs buzz, to seeing Mt. Evans in the distance, smelling the fresh air, and to even hugging a tree, we used all of our senses (except taste) to explore our environment. 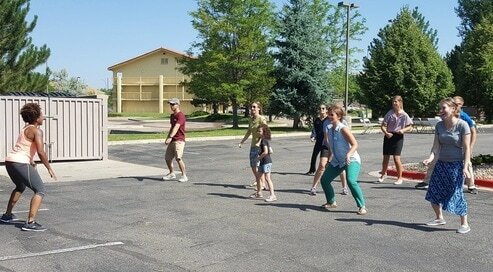 To top it off, we even learned about Colorado history and the Walker legacy. Cheers to getting out and exploring beautiful Colorado. Happy trails indeed. Getting Mucky at MuckFest MS! We came, we climbed, we jumped, we slid, we swam, we crawled, we hid from lightening, we conquered, and don't worry we have showered..MS take that..you are going down! 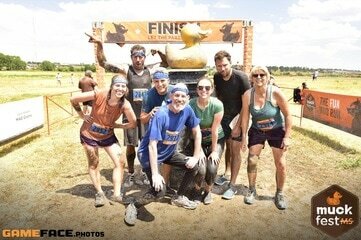 Thanks to all who supported the WMC team at Muckfest this year! All funds raised support the research and work of the National MS Society. Produce in Action at the Farmer's Market Tour and Class in Louisville! Thanks to all that came out to the Louisville Farmer's Market Tour/Class this summer. We not only learned about eating local, seasonal, organic, non-gmo foods, but we also got to take some home and eat them! What fun! 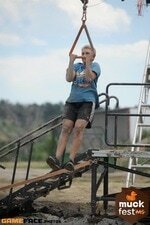 Check out the photo album on the WMC Facebook page! Get your yoga on! The WMC crew did just that on a lovely June morning at Westminster City Park. From stretching, to breathing, to laughing and more, thanks to those who participated in our first ever Family Yoga event. What a great way to start the day! Can we do this every morning? 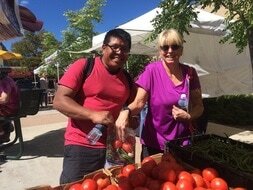 We had a fun day exploring Arvada Farmer's Market and eating delicious veggies with Christina at Natural Grocer's! Thanks to those who came out to learn about eating local, seasonal, organic, non-gmo food on a budget! WMC Hosted First Ever Community Health and Wellness Fest! Thanks to those who came out to our first ever Community Health and Wellness Fest last month! 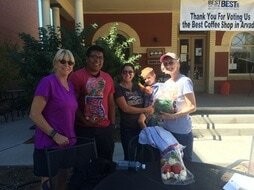 What a fun day - filled with fun activities including Zumba, pickleball, caricature drawings done by Armand, great food from Farm to Truck, an informative class on heart health presented by Dr. Hammond, lots of health screenings, chiropractic appointments, sports physicals, and so much more! See you at the next one! Westminster Medical Clinic represented well at MuckfestMS this year! Thanks to those who participated or sponsored our team! The WMC team had a great time climbing, crawling, swinging through mud, and raising money for the National MS Society. Be sure to check out the crew in action in the photos posted on our Facebook page. 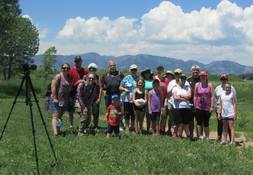 Photography Nature Walk a Success! 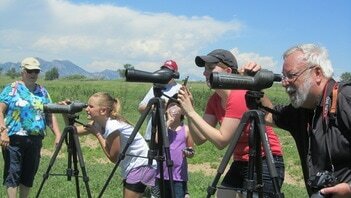 Thanks to all those that came out for our first every Photography Nature Walk! The sun was shining, the water was sparkling, the eagles were nesting, the patients and staff were walking, the cameras were clicking, and the smiles were spreading! 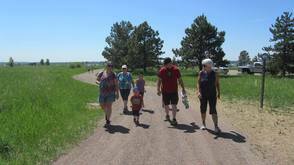 Want to see more pictures from the walk? Check out our Facebook page by clicking the link below. WMC Day at Westminster Rec Center...Learn What Westminster Has to Offer! 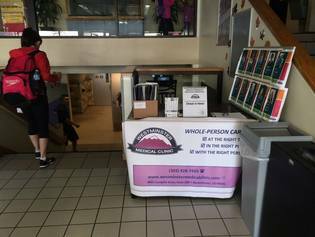 Thanks for coming out and joining Stacey, the Health Coach, for the WMC Day at the Westminster Swim and Fitness Center - a free day for all WMC patients and their families. We do these events because we appreciate you and want to support you in being active. Thanks to Westminster Parks and Rec for supporting our clinic and allowing us to offer these opportunities to our WMC family. We hope to continue to offer this event as a way for you to learn and experience what the rec center has to offer from swimming, to exercise, to classes, and more!